Sober Look: The secured bond market - a new trend? The secured bond market - a new trend? As the corporate loans approach maturities, companies have been refinancing them by issuing bonds (some $60 billion of HY issuance has been used to pay down loans this year). With demand for fixed income continuing to surprise on the upside, new bond issuance has been quite strong. However some weaker, more leveraged, or less known names, had to use a trick to entice investors. As the collateral pledged for loans got freed up (with loans getting repaid), the companies pledged it to the new bond holders. These are the so-called secured bonds, and unlike standard corporate bonds which are general obligations of the company, these bonds have specific collateral pledged against them. 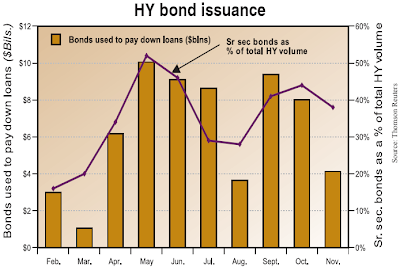 Nearly 40% of recent bond issuance has been in secured bonds. The question still remains whether this is a long-term trend. It would mean that the leveraged loan market at least in part is getting replaced with secured bonds. But demand for leveraged loans also continues to be high, especially as some existing inventory is getting paid down. If the loan syndication market recovers, secured bonds may become a temporary phenomenon.